Framed Wolftrax Alloy 1.0 X5 Fat Bike 26"
Enter the game changer. From Framed Bikes comes the Wolftrax Alloy. 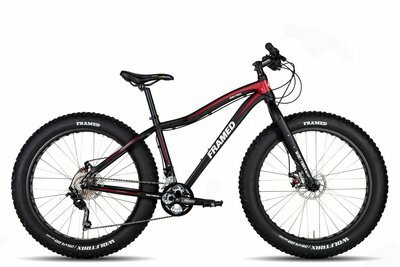 This bike is primed to blaze trail and crush terrain, stocked with 26 x 4” fat tires with the versatility to upgrade to a 4.8” wide tire. This go everywhere, do anything fat bike is the crown jewel of the Framed alloy fat line up. No matter if it’s in deep snow, loose dirt, sharp rocks, or wet roots. The Wolftrax Alloy will handle it all with ease. The precision functionality of the SRAM dominated drivetrain combined with excellent stopping power delivered by Avid BB5 mechanical disc brakes ensure you get where you’re going without compromise. All in all, the Wolftrax SRAM X5 is a low maintenance cross country focused fat bike for the no nonsense all season rider.